Feb. 22, 2018 10:56 a.m. Being around barns and horses can give a kid some of the most important tools in life. Discipline, teamwork, focus; important lessons that can’t be learned from any text book. But they can be learned from picking yourself up from a dusty riding ring floor. Or when a classmate teaches you a roping trick they figured out last week, to save you from struggling. These great big lessons are learned from trying and failing, but loving it so much that you keep going back for more. And yes, they’re even learned from mundane tasks like preparing tack and sweeping barn floors. But not everyone has access to a barn, much less a horse. And that’s why Chilliwack secondary school’s newest experiential program has already garnered so much praise. 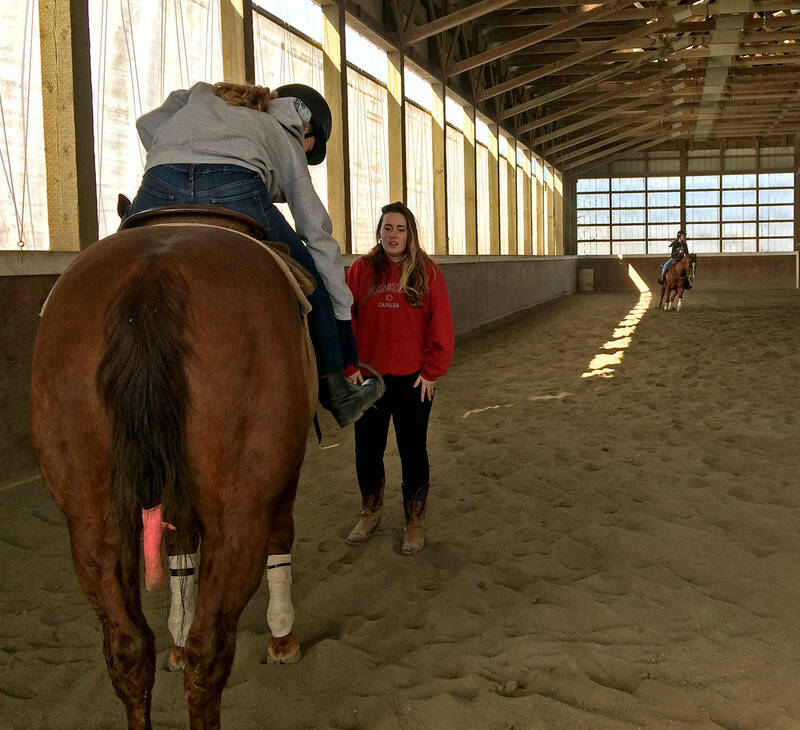 Just in its second year operating, the Equine Program has Grade 10 students immersed in horsemanship for about half the school week, during the second semester of the school year. The second group of students is just beginning their journey with the program, led by science teacher and equestrian Avril Broekhuizen. She partnered with West Coast Training and Horsemanship, at Cristyhill Farms on Camp River Road in Rosedale. There, she works in tandem with Jim Greendyk, a professional reining trainer and competitor with the National Reining Horse Association and the American Ranch Horse Association. He offers the lesson horses, facilities, equipment and the majority of the riding instruction, along with his assistant trainer, Jaime Fischer. While Broekhuizen is an accomplished rider and riding teacher herself, she has also planned the immersive program around her other passion – environmental sciences. Within the program, the students complete Equine Studies 10 (written by Broekhuizen), Environmental Science 11, ConnectEd 11, and Physical and Health Education 10. But they also learn those life-long skills around the barn, and they learn what it takes to handle a show horse. They learn everything horse safety, basic care and maintenance, including grooming, feeding, saddling and horse first aid, as well as riding skills. As for science, when the weather warms up they’ll be sampling water and soil from the farm regularly, learning about biodiversity. They’ll take field trips, including to a wetland in Agassiz to study endangered frogs. Last year’s field trips included a trip to a race track, and to an equestrian veterinarian. It all fits nicely into the new curriculum guidelines rolled out by the BC Ministry of Education, too, Broekhuizen says. And while that’s a nice, recent fit, this idea of hers has been 10 years in the making, she adds. 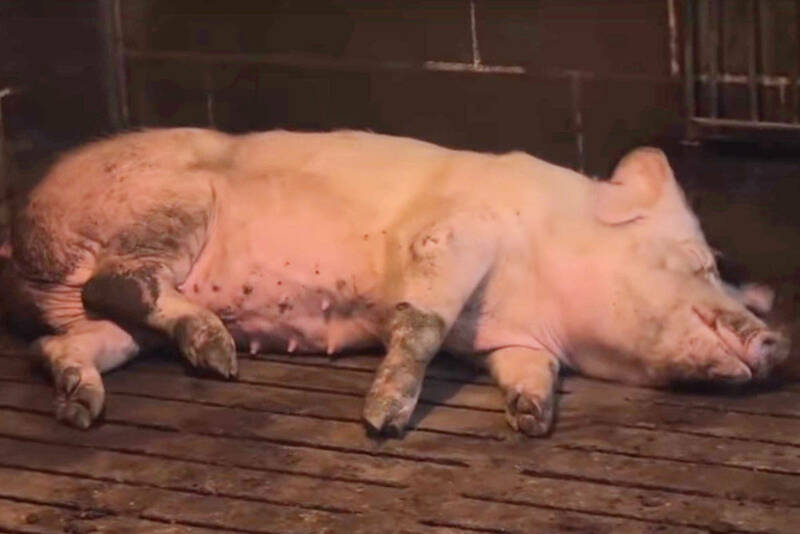 They spend three afternoons a week at the farm, and can only get into the program by pulling good grades and exceptional attendance in their regular classes during the first semester. There’s a long wait list, and right now it’s time for Grade 9 students to register for next year already. Broekhuizen says it’s a good fit for all sorts of students, whether they have a hard time sitting in a classroom all day, have an interest in horses, or want to explore different types of hands-on sciences early on. 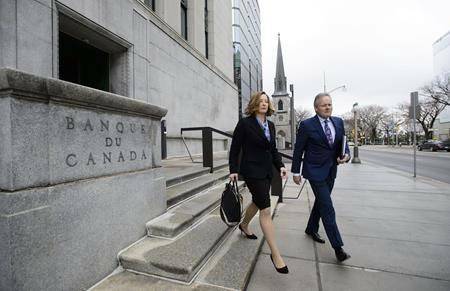 It’s also a nice “bridge” for Grade 10 students, she says. 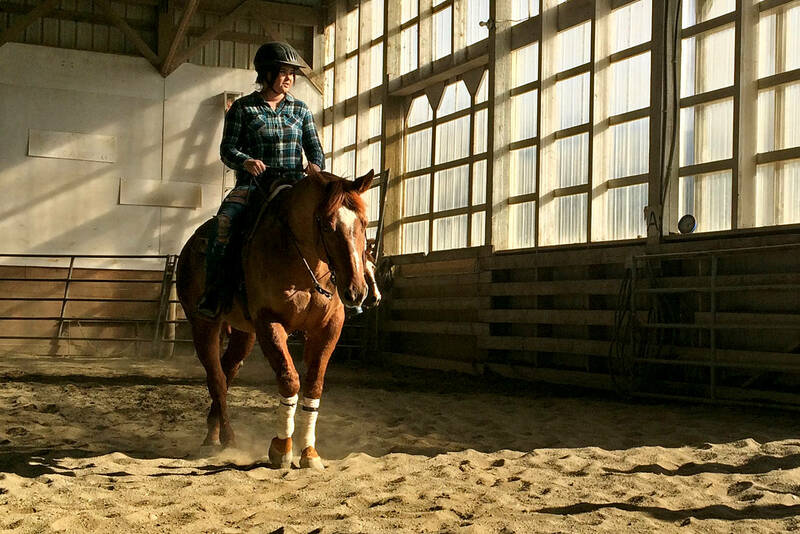 Delaney MacMillan has been riding horses for 10 years already. When her mom saw the program listed on the CSS website, and for only $100 registration fee (for transportation to and from the barns three times a week), she couldn’t believe the value they’d be getting. “And I get to do something I’m passionate about,” MacMillan says, standing in the riding barn with her classmates. Berinke Gebhardt, an exchange student from Germany, is also in the program this semester. She’s been riding for eight years, mostly dressage. This program is a chance for her to ride western style, which uses a bigger saddle and involves more reining and obstacles like barrels. Mercedes Hall is another long-time horseback rider. But she brings some bronco and steer-riding experience along with her to the course. The idea, Broekhuizen says, is to build a class with a mix of experienced and new riders so they can model after each other. The more experienced riders can literally show the newer riders the ropes, and intrinsically learn about mentoring. That’s exactly what Kara Hildebrandt is doing. She’s from last year’s group, the first cohort of Equestrian students. And this semester she’s back as a Humans Services student, helping out the teacher as a mentor and earning credit toward graduation. And she’s also getting time in the barn. 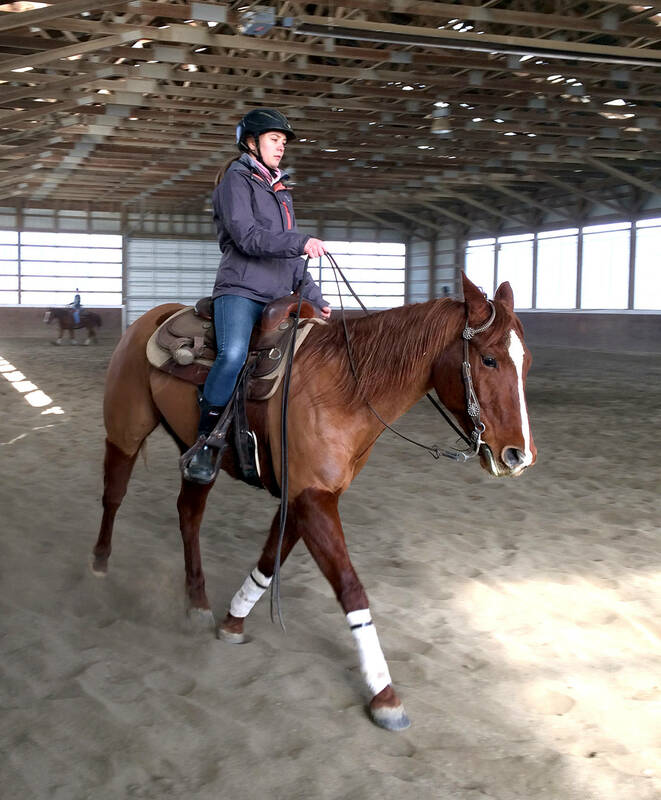 As the students finish up their riding lesson, Hildebrandt found a minute to hop on a horse and take a few circles around the barn. It had been a while, many months, since her last ride. As she pulled the reins and the horse came to a full stop, she broke out in a mile-wide smile that could be seen clear across the darkened barn. “It’s been so long,” she said. 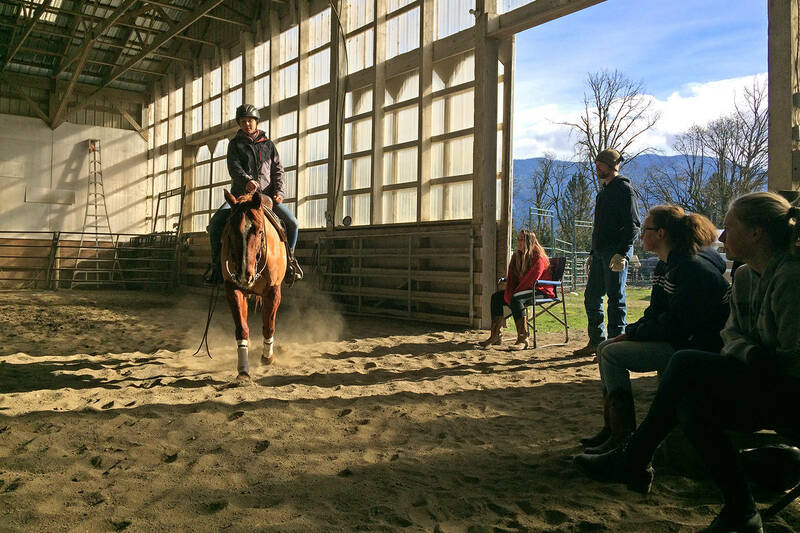 To learn more about the CSS Equestrian Program, visit them online atcss.sd33.bc.ca/equestrian-program.